There are 6091 more sites. Code Integrity is unable to verify the image integrity of the file \Device\HarddiskVolume1\Windows.old\Windows\winsxs\x86_microsoft-windows-securestartup-core_31bf3856ad364e35_6.1.7600.16385_none_34b0fc0c53728e43\fveapibase.dll because the set of per-page image hashes could not be found on the system. Code Integrity is unable to verify the image integrity of the file \Device\HarddiskVolume1\Windows.old\Windows\winsxs\x86_microsoft-windows-s..trics-sensoradapter_31bf3856ad364e35_6.1.7600.16385_none_13881e44d6ccca6b\winbiosensoradapter.dll because the set of per-page image hashes could not be found on the system. Code Integrity is unable to verify the image integrity of the file \Device\HarddiskVolume1\Windows.old\Windows\winsxs\x86_microsoft-windows-s..rics-storageadapter_31bf3856ad364e35_6.1.7600.16385_none_d67ca3c3b6af653e\winbiostorageadapter.dll because the set of per-page image hashes could not be found on the system. You have multiple tasks from some very old games, a bad Sonic driver and a Hosts file that is clogged with garbage but that's probably not enough to cause the problem. Let's get some more info before I give you a fixlist. Is your sound working? 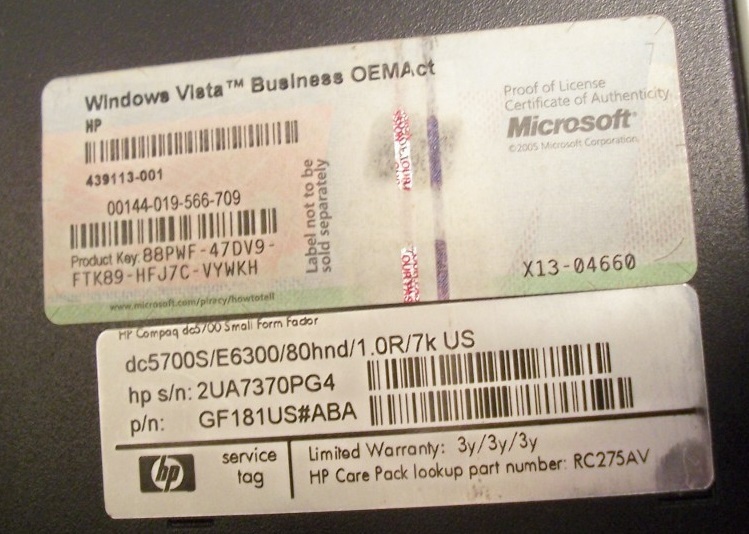 What make and model, service tag (Dell) or Serial Number (HP)? Should be a tag on the bottom if laptop, back or side if desktop. Save it to your desktop then run it (Vista or Win7+ - right click and Run As Administrator). Click twice on the CPU column header to sort things by CPU usage with the big hitters at the top. File, Save As, Save. Note the file name. Open the file on your desktop and copy and paste the text to a reply. Right click and Paste (or Edit then Paste) and the copied lines should appear. Hit Enter if notepad does not open. Copy and paste the text from notepad into a reply. File, Save as Text File, (to your desktop) note the name it gives. OK. Open the file in notepad and delete the line that gives the serial number of your Operating System. (It will be near the top, 10-20 lines down.) Save the file. Attach the file to your next post. Attaching the log is the best option as it is too big for the forum. Attaching is a multi step process. Choose File and click on it. Point it at the file and hit Open. Now click on Attach this file. Save it then right click and Run As Admin. It will install and then start the program. It will tell you to click on the Start button but there isn't one. Instead click on the green arrowhead (looks like a Play button). Let it run for at least 20 seconds. Then hit the red box to stop it. Edit, Copy Report text to Clipboard then move to a REPLY and Ctrl + v to paste the text into a reply. AppleMobileDeviceService.exe 0.01 2,752 K 8,852 K 1844 (Verified) Apple Inc.
mDNSResponder.exe 1,992 K 5,680 K 1512 (Verified) Apple Inc.
That instruction about the TASKLIST didn't work. I would see the Notepad flash for an instant then disappear. I tried several times. This is as far as I have gone for now. I do have sound, though. And, if I am reading the Service tag correctly, I have an HP Compaq 2UA7370PG4. Maybe I should also mention that I bought this as a refurb from a local electronics repair shop in January 2012. They may have just used the case and put a new OS in it. Edited by debodun, 19 October 2018 - 12:02 PM. Your system appears to be having trouble handling real-time audio and other tasks. You are likely to experience buffer underruns appearing as drop outs, clicks or pops. One problem may be related to power management, disable CPU throttling settings in Control Panel and BIOS setup. Check for BIOS updates. LatencyMon has been analyzing your system for 0:01:05 (h:mm:ss) on all processors. Note: reported execution times may be calculated based on a fixed reported CPU speed. Disable variable speed settings like Intel Speed Step and AMD Cool N Quiet in the BIOS setup for more accurate results. The interrupt to process latency reflects the measured interval that a usermode process needed to respond to a hardware request from the moment the interrupt service routine started execution. This includes the scheduling and execution of a DPC routine, the signaling of an event and the waking up of a usermode thread from an idle wait state in response to that event. Interrupt service routines are routines installed by the OS and device drivers that execute in response to a hardware interrupt signal. DPC routines are part of the interrupt servicing dispatch mechanism and disable the possibility for a process to utilize the CPU while it is interrupted until the DPC has finished execution. Hard pagefaults are events that get triggered by making use of virtual memory that is not resident in RAM but backed by a memory mapped file on disk. The process of resolving the hard pagefault requires reading in the memory from disk while the process is interrupted and blocked from execution. NOTE: some processes were hit by hard pagefaults. If these were programs producing audio, they are likely to interrupt the audio stream resulting in dropouts, clicks and pops. Check the Processes tab to see which programs were hit. Process Explorer looks very good. Since it does we don't need the Tasklist stuff. Speccy says the Temps are good which is often a problem with older systems. They tend to get clogged with dust around the heatsinks and fans. Also you only have 3 GB of RAM. You really need at least 4 GB. You have one slot free so you could add 1 GB for under $10 if you shop around. Amazon has1GB DDR2 667MHZ Desktop Computer Memory - Hynix HYMP512U64CP8-Y5 which matches your existing RAM for $8.65. Unfortunately your Motherboard won't take more than 4 GB so that's all you can do. Your Make and model info doesn't work. Can't find anything from that number. Are there others? I'd like to update your video driver but it's always best to check with the manufacturer first to see what they offer. If you are not using it I would uninstall Kodak EasyShare software. hit Enter. That should bring up a new window. Click on the Boot tab and then check the Boot Log box. OK. Don't reboot yet. Run FRST again as before. Make sure Addition.txt is checked and hit Scan. Post both logs. Control Panel, (View By: Large Icons) Folder Options, View. Check Show Hidden Files,Folders and Drives. Then you should be able to see it. First, thank you so much for helping me. I was probably a huge effort to go through all those logs! It was comforting to know some things look good. Second, I do use Easy Share quite a bit for downloading photos from my camera and photo editing and I know it is a resource hog. When I use it, I close the program when finished. Also, I'm not sure what numbers you need from the case, all I can do is attach a photo of the external tags. As I mentioned before,this is a re-built system. The case says originally the OS was Vista Business, but I know it is running Windows 7-64 bit as the current OS. The electronics shop probably just used the case installed new software. I will get to those other scans in a day or two - you know how weekends are. Thanks again. Is this the boot log you wanted? Yes that looks pretty clean. The Did not loads are what we look for and the ones in your log are pretty standard so the boot seems OK. Don't you have a fixlist to process? CMD: FOR /F "usebackq delims==" %i IN (`wevtutil el`) DO wevtutil cl "%i"
Edited by debodun, 22 October 2018 - 03:33 PM. Is that the whole log? Doesn't look like the fix finished if it is. Something not working right. Did you right click on FRST(64) and Run As Admin? Can I see a new FRST scan?